Despite the presence of huge water resources, several factors are contributing to water security issues in Asia in general and southern Asia in particular. From this region flow some of the major rivers in Asia, such as Yangtze, Yellow, Indus, Yarlung Zangbo/Brahmaputra, Salween, Mekong, Irrawaddy and others. These rivers drain several million square kilometres and have become lifelines for the food security of billions, apart from transporting goods and services and for industrial development. 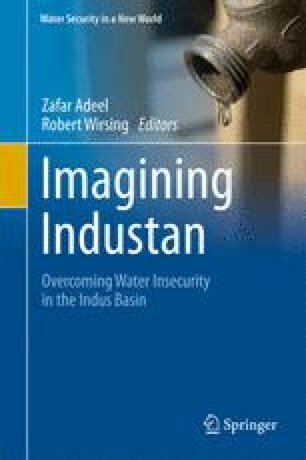 Countries such as China, India and Pakistan sit on enormous water reserves in this part of the world, and these are in the recent period triggering securitisation of water-related issues due to a number of reasons. China has the fourth largest freshwater reserves in the world. However, due to increasing demands over water use, such resources are being increasingly and extensively exploited for economic purposes. These issues have triggered wide debate among officials, lawmakers, scholars, environmentalists and others. In order to address water scarcity issues, China recently launched several initiatives and programmes such as the South-to-North Water Diversion Project (SNWDP), construction of either water diversion dams or hydropower dams and the like. It is argued in this chapter that while in the overall water discourse of China, the Indus River takes a marginal seat in comparison with other major rivers, China has followed a two-pronged approach, namely, stop-gap understandings on water sharing or, more accurately, water measuring with the immediate lower riparian states, including India, while actively exploring cooperative efforts with the lowest riparian state, Pakistan, in regard to dam construction and hydroelectricity generation, including even eventual protection of these facilities with China’s paramilitary/military forces in the longer run. Thus, cooperative efforts do exist in the Indus basin between China and Pakistan, while in the case of China and India, both cooperative and competitive elements are forthcoming.